Reigning World Champions Germany held their nerve in a dramatic penalty shootout to secure their spot in the semi-finals of the European Championships, securing their first win over Italy in a major tournament in the process. Over the course of a tactical affair, Mesut Özil found the breakthrough in the second half, firing home after a deflected cross. However, the lead wouldn't last long, as Leonardo Bonucci converted a penalty after Jérôme Boateng handled the ball in the area, with both nations proving well matched for one another through the full-time whistle and extra time. It would come down to the dreaded spot kicks, with some uncharacteristically poor penalties from Die Mannschaft going unpunished due to equally poor attempts from the Italians. But as the shootout wore on, Darmian's miss would prove crucial as Jonas Hector stepped up to score the winning penalty and send the Germans to the semis. Things were contested on a microscopic tactical scale right from the outset, with referee Viktor Kassai's whistle signalling a first half where the robust defences of both nations would ultimately prevail. Joachim Löw's side were dictating most of the possession while their counterparts tried to find opportunities on the counter attack. But the German manager was forced to make an earlier than expected chance when Sami Khedira's injury bad luck continued as he made way for Bastian Schweinsteiger. It was the consequence of a strong challenge in the middle of the park, something of which was prominent throughout. Éder receiving an elbow to the nose was a rare piece of action in an otherwise drab half for the purists. The ball would be in the back of the net later on, although Schweinsteiger was cautioned for fouling his counterpart in the box. Up until the late stages of the half, the teams were cancelling each other out, their lineups and game plans were virtually identical. Towards the end of the half, there was a small serving of goalmouth action, as Thomas Müller tamely directed his shot into the hands of Buffon, before Giaccherini burst down the left and into the box, where his cross fizzed past goal, bouncing out to Sturaro who saw his shot blocked. Spectators were yearning for more action after the break, and they'd get it. Mario Gomez patrolled early on in the box with the likes of Barzagli being forced to snuff out the early danger. On the other end, the Azzurri moved the ball around with increased intent, and the volume of challenges increased. The World Champions would soon become more active in their attacking department, and had it not been for the heroics of Alessandro Florenzi, they would've found the goal. Mario Gomez set up his compatriot with a run towards the box, where his shot was bound for the back of the net only for the Italian to keep it out with his boot at full stretch. Jerome Boateng then smashed over the bar from the subsequent corner kick. With an hour on the clock, the game was far more stretched and action-packed. Jonas Hector was getting down the left wing and not so long later he would contribute to the opening goal. A mistake from Florenzi helped Gomez surge down the left, where he played in Hector, who's ball across the box was deflected, bouncing into the path of Mesut Özil who fired it in his stride. The Germans had raced in front, and almost had the game wrapped up when Italy were up against the ropes. Running the show, Özil lobbed a ball perfectly over the defensive line, where Gomez was waiting in point blank range. He turned and tried to knock it past Buffon, but his outstretched hand helped him get fingertips to it, pushing it just over the crossbar. That was the momentum boost and wake up call which Conte's men needed, as Graziano Pellè had a shot at the other end. 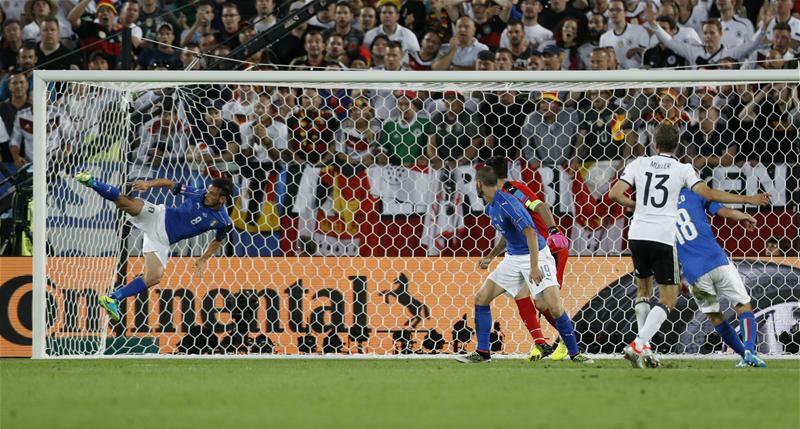 Jerome Boateng then handed Italy a golden opportunity to get back into the game after a sustained period of attack. In an attempt to get rid of a cross, his flailing arm touched the ball making it a clear decision for the referee: a penalty to the Azzurri. Leonardo Bonucci, of all people, stepped up to take a rare spot kick, beating the Neuer who went the same way, slotting it to the bottom right corner as things were all levelled up. Thirty more minutes were on the cards in Bordeaux as normal time wasn't enough time to separate the two European heavyweights. Players were tired as spot kicks loomed in the first half of extra time, a 15 minute period filled with fouls and challenges while goal mouth action wasn't in abundance. In the final 15 minutes of the game, Italy did have their nervy moments as Draxler fired off target with an acrobatic attempt while Neuer's drop kick hit the keeper's feet although nothing more would come from it. Conte's late inclusion of Simone Zaza signalled what everyone knew - they were going for the penalties. And when the referee blew his whistle once more, it was down to the spot kicks. Insgine and Kroos converted their penalties before Simone Zaza blasted over and Muller was stopped by Buffon, making it square at 1-1 after 4 penalties. Barzagli then converted before Ozil struck the post, only for Pelle to smash the next one wide and let Draxler tie it up, making it sudden death at two apiece. Leonardo Bonucci wasn't able to score his spot kick, as was Schweinsteiger who fired over. It was all tied when Boateng smashed it to the far corner to make it 5-5, before Darmian was saved to set up Jonas Hector's winning penalty, as Germany booked their spot in the semi finals.